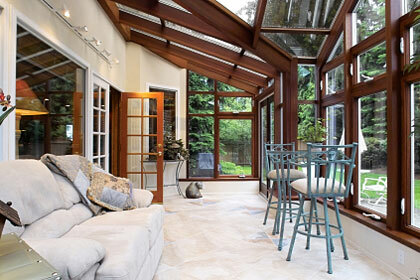 An addition can give your home much-needed space, comfort, and style. One of the most fun parts of putting an addition on your home is the planning and dreaming stage. The first thing you should do in your planning stage is figure out what issues your addition will address. Is your bedroom too dark and small? Would you like your kitchen to be lighter and larger? During this stage, you need to pinpoint your needs. Before you go any further, determine your budget. It's all well and good to decide that you need a larger bedroom, but that master suite complete with double walk-in closets, veranda, and hot tub may be well beyond your means. Now that you know what you need and have a budget, start planning and dreaming! Look at basic room additions, and decide which will best fit your needs. Will an outside structure address your needs, or will a bump-out be the perfect way to get the space and architectural interest you desire? Are you putting on a whole room, or will a second-story addition solve your problems? Planning an addition is not only an opportunity to add space to your home, it also allows you to address any layout issues that your home currently has. For example, if there are areas in your home in which the room flow doesn't work, careful planning of your addition might help you solve this problem at the same time. Once you have an idea in your mind of how large and where you would like your addition to be, be sure to talk to your town's zoning and planning offices before banging the first nail. Many towns have regulations regarding additions, that address things like the number of bedrooms a home has or how high it is. The planning and dreaming stage is the right time to make your wish list. Make a list of features you want in your addition, and number them in order of priority. Later, you can work with your contractor to determine how many of these features will fit into your budget. For lots of room addition ideas as well as room planning and decorating tips, visit HGTV Rooms and Better Homes and Gardens Room Decorating.